Can Cloud Interdependencies Cause Meltdowns? Walter Riker sends along a link to a thoughtful American Scientist article which asks a good question: " ... Will AI create mindlike machines, or will it show how much a mindless machine can do? ... " Our enterprise attempted to solve our most gritty problems using AI, but we were premature. We failed to get a general lasting success. Now twenty plus years later, are we ready to make another, serious try? Now armed with more data, the ability to integrate more analytical methods and a way to integrate the intelligence assist of people, will it succeed? In the WSJ: Excellent piece on how book reading is now less than a solitary activity with e-books. The new books are also reading you and gathering and leveraging deep analytics about this activity.
" ... In the past, publishers and authors had no way of knowing what happens when a reader sits down with a book. Does the reader quit after three pages, or finish it in a single sitting? Do most readers skip over the introduction, or read it closely, underlining passages and scrawling notes in the margins? Now, e-books are providing a glimpse into the story behind the sales figures, revealing not only how many people buy particular books, but how intensely they read them ... "
" ... One of the exciting things that you can do with Recorded Future is rewind time in order to quickly discover and analyze the timing of public statements made by an individual before, after, or during a particular period. Major political appointments earlier this week, following exceptional elections in Greece and Egypt, provide a pair on whom we can conduct such research: Greek finance minister Yannis Stournaras and Egyptian president Mohamed Morsi.... "
The newest, easier to use version of Recorded Future is now available for test in by invited Beta for free. See the link above. Thoughtful piece in the HBR blogs on assessing your network. Thinking of this as interesting " ... They came up with three components that would make members valuable to any network: They were part pack rat, part librarian, and part Good Samaritan. The pack rat brought a range of resources that could be accessed and used to create new and fresh ideas. The librarian brought information and knowledge. And the Good Samaritan had the attitude and practice of sharing. A network built on relationships between talented, knowledgeable, and supportive members is worth joining. If that relationship doesn't exist, you may need to look elsewhere.... " And how it relates to leadership, at least in Macaque monkeys. Whether you are a computer scientist, researcher, or student, you will benefit from the rich and valuable content presented in this virtual forum, and also have a chance to share ideas and ask questions in real-time on Twitter at #FacSumm. A web page for the streaming video will be available in ACM's Learning Center on July 16.... "
In Innovation Excellence: A good discussion of the difference between strategy and innovation. Obvious, perhaps, but innovation should be included to some degree in any strategy, to make sure you keep up with the changing world and your competitors. There is far more in a good strategy. Correspondent Kevin Judd sends along an article making the case that the self-checkout is here to stay. I agree, the decrease in labor requirements in retail are too tempting to ignore. We examined the cost and training requirements of self checkout systems as well as how they changed the nature of the shopping experience. What may well change is how self checkout is achieved. Will it move from the semi-automated checkout you see today to hand scanning in the aisles, or to the use of Smartphone Apps? Ars Technica reports on the closure of Minitel, the popular French precursor to the Internet, on June 30. Apparently it is still is profitable to French Telecom. There were copies of Minitel-like services in a number of other countries into the 1990s, including in the US. We explored it at its height in the late 1980s for potential advertising models. It is one of those things that you are surprised to learn is still around. But the final days are now here. Suggestion that Microsoft is in the midst of reinventing itself, with Windows 8 and more. In particular the fact that smartphones will increasingly become our platforms of daily interaction. So MS will need to be strongly involved to survive. In FastCompany: This general idea has been around for some time, but it has never been implemented well. Consider the advertising implications.
" ... Itching to spray a wall with graffiti but not down with the whole civil disobedience thing? All together now: There's an app for that ...Wallit is a new location-aware app which advertises itself with the tagline "walls for places." Essentially it lets its users place a digital Post-it note, or an invisible piece of graffiti if you like, on a virtual "wall" connected to a real place on Earth. Despite its newness, it just added a social element to version 1.1 called "super walls" that links the tags for similar places around the world, so you can leave your mark at a local Starbucks and also see what other folks at the 15,000 other Starbucks venues around the world are saying. It's free, silly, lovable and a taste of the reality-blurring that's about to become part of our normal existence.... "
In Analytics Magazine from Informs: IBM surveys the marketing industry, providing some interesting statistics about the relationship of IT and marketing needs. " ... finds that chief marketing officers and chief information officers must join forces in order to connect with today’s consumer across new channels including mobile devices and social networks. Fully 60 percent of marketers point to their lack of alignment with the company's IT department as the biggest obstacle to reaching today’s consumers ... "
In the state of Massachussets, individual price tags may no longer be required on store items, if a new bill is passed. Replaced by individual digital scanners. The implication is that the scanners, whatever their ultimate form, can then be used for other kinds of interaction with the shopper, besides just checking prices. The devices have been stationary or mobile hand held in various implementations. This was a concept we tested for years in store laboratories and in real stores. At the right, an example of a test device at Stop n Shop we helped design and test. Always interested in new ways to make complex data, processes, sensors and their interrelationships as clear as possible to the decision makers. And make the relationships as easy as possible to maintain. We used methods like concept and process maps for years. Even used them for collaborating between researchers. Here is a new, visually strong method that attempts to do the same thing that is worth examining. Mobile is changing retail at a remarkable speed. We saw the implications of this very early on, before the smartphone. A text based phone like the Blackberry could even then be used to organize your shopping lists. Now it is much more than that, two way interactions between brand and consumer are increasing in volume, and the volume of interaction data being collected and how it is leveraged is becoming more sophisticated. Good Computerworld article. Emphasizing that it does not require a big budget, but does require business understanding and sponsors to agree that this is a priority for them. Includes a good checklist that is well worth considering for any project. In Forbes: What is in Store for the Brand. Overview mention of a number of issues the big retailer is dealing with in marketing and merchandising, for example 'Showrooming' and the use of digital location technologies, like their recent work with Shopkick. A research brief on media influence. " ... According to The Media Comparisons Study, from TVB with Knowledge Networks, consumers credit TV ads as most influential in making a purchase decision. Television reaches more people, and people spend significantly more time with television each day than they do with radio, newspapers, magazines, the internet, and mobile, and TV commercials drive viewers to go online to find out more.... "
I just got a chance to interview N2N Global. A business intelligence and analytics provider for food supply chains. Aimed at Food Safety, Quality Assurance and supply and product traceability systems. Their CEO Ernesto Nardone is a former IBMer who worked in the area of using expertise-based systems that led to some of IBM's recent AI applications like Watson. N2N is using IBM's Cognos to do Business intelligence and related basic analytics to utilize the huge amounts of data, millions of records per month, for the Food Coop Cherry Central. Cherry Central has a space on Facebook which succinctly describes the work done. See also this press release for more detail, which emphasizes how this relates to consumer food safety. In particular I was interested in how this data can be connected to the decision process. They are doing this now by looking at outlier analysis, reporting and alerting. A likely good next step is to include process models that specify set of rules based on the knowledge of food experts, and also including quantitative analytical processes that can find patterns, predictively forecast future situations and bring together this intelligence to make next steps safer and more efficient. Bring on the tool set to make this happen. That leads to smarter commerce. Cherry Central and N2N won IBM's Engine of the Week for midsize businesses. A part of the Midmarket initiative. " ..... This honor is given to midsize businesses that have transformed themselves using insight and IBM technology.... " . Their transformation has started with the automating the large amount of paper that was once needed to run any complex business, large or small. It will be instructive to continue to follow their effort as food knowledge is included to make the enterprise truly intelligent. Citia, An App that aims to reinvent reading. An intriguing notion I am exploring. " ... Some of the world’s best ideas live in books, but are fighting to be heard in the digital carnival that surrounds us. At Citia, we use professional writers, editors, and designers—in partnership with major book publishers—to reorganize and condense existing works of serious nonfiction.... "
A slide show from Baseline. It is instructive to look at these examples, some very well known. I think many companies need to look at the possibility of reinventing themselves. I don't like slide show formats , would rather have a document I can read and scan for examples and more details. In Adage: The forward motion continues. Why has this been so successful? This is the first time that analytics methods have been applied to the complete process of delivering ads. Not surprising it has worked very well. An excerpt from Nassim Taleb's forthcoming book: Antifragile. On order.
" ... When consuming information, we strive for more signal and less noise. Intuitively we feel like the more information we consume the more signal we receive. While this is probably true on an absolute basis, Nassim Taleb argues in this excerpt from his forthcoming book, Antifragile, that it is not true on a relative basis. He contends that as you consume more data, and the ratio of noise to signal increases, the less you know what’s going on and the more inadvertent trouble you are likely to cause ... "
Another good piece on the status of 3D printing and remote manufacturing in GigaOM. Some good examples of where it can be practically used. I still think its application is relatively limited. A description of recent IBM work in embedding analytical methods in decision making. In our own experience it was always a case of how analytical methods could be included as part of a decision to improve it. Making it good, better and ultimately best. Look forward to take a further look: " ... The software represents a new class of Decision Management capabilities that revolutionizes the way organizations gain, share and take action based on information gathered as part of business processes such as marketing, claims processing and fraud detection. In these, and other data-rich areas – where anywhere from a thousand to five billion decisions are made daily – the software will put forward the next best action to front-line employees ensuring optimal interactions and outcomes. ... "
Engadget asks what works. We examined this almost a decade ago. I thought about it for a real application. Was there a requirement, or any value in mimic-ing a real life storefront to make them work? I virtually watched as IBM and several retailers spent time working on this problem in environments like 'Second Life', but eventually abandoned the idea. Was anything learned there? Engadget here asks for current approaches. I see that the Evernote note-taking company has acquired the Penultimate handwriting capture system. More details here. I have used and enjoyed Evernote on tablets, phones and laptops for some time. I have not used handwriting directly on a tablet format device for a long time. Not sure that being able to do that buys me very much, since I am just not used handwriting for note taking recently. And my handwriting, once very accurate, has deteriorated much from lack of practice. Will be interesting to see if I will use it. Update: I took a closer look at Penultimate, and its more of a generalized note taking iPad app than a handwriting interpreting method. Good if you like sketching and have some artistic inclination. Similar to Evernote's Skitch tool. I assume it will be integrated with Skitch. May work or not depending on the width and clumsiness of your fingers. An interesting change among gamification vendors and underlying information organization. I have enjoyed and found useful the gamification.org wiki for examples in this technology. But this could likely make the result less objective. I hope that will not be the case. The documentary. Google re-imagines what online advertising will become in their project Brief. Interesting to see what they are up to, especially considering the kind of supporting data they have access to. " ... We took some of the most loved ad campaigns from the ‘60s and ‘70s and and brought them back to life for the digital age with the help of the advertising legends that made them in the first place. Together, we created a series of ads designed to start conversations and fire up imaginations about what technology can make possible, such as ads that enable two strangers on opposite sides of the world to connect over a can of soda, or that translate a customer service experience into an instant, shareable, personalized animated video. ... "
New: Google mapping and location infrastructure, used to manage field crews. An analytics application. In Google Lat Long: Having been involved in several crowd sourcing efforts, its always good to see further and more complex examples. Mapping would seem to be an obvious application, when linked to alerting based on the data acquired. I have just become involved in a new collaboration with James Tenser of VSN Strategies. " ... Consultant to the retail consumer products industry and author of books, blogs and analysis ... " . See also his interesting blog. It has been obvious that the US Postal Service needs to adapt to change. Wharton discusses this in some detail. They have changed considerably, introducing many new services, but with only marginal improvement. Yet the strategic change has not at all matched the contextual changes occurring around them. In CACM: Reexamining the popular meme of tight connectivity of our social network. The small world. In 2000 we visited the Santa Fe Institute for a workshop on the use of such connectivity to understand the flow of marketing and the message, leading to a number of word of mouth experiments. Well before social networks. Leading to Tremor and other successful methods. A Wharton special report on practices for sustainability and greening the supply chain. Best practices and future trends. Focusing on store-level data enables CG companies to win in modern retail. Here, a member of Procter & Gamble’s Retailer Connect Program candidly reveals how the company is using POS data to identify out-of-stock/zero sales incidents and then act in store to fix those opportunities and drive sales.... "
Not new, but continuing to increase in use in the American home. Mainstream and upscale uses are increasing too. In ComputerWorld: Will health care organizations need what is akin to a Chief Mobility Officer? Mobility is a key to efficient healthcare. Linking together wherever the patient may be with wherever the multiple kinds of professional and sensor and intelligence resources might be. Sometimes crucially in real time. Its also the case in may businesses, but in particular in the healthcare industry. Good thoughts in the article. In Wired: Future thinking relies on our memory of the past. And our memories of the past are not as reliable as we think. They are easily altered and deceived. Research into this whole seemingly unreliable memory system takes a forward look. Looks like we have even more of a need for better augmentation. The Iterated Prisoner's Dilemma. The work of Robert Axelrod and William Poundstone fascinated us in graduate school as we tried to apply AI techniques to decision strategies. I see that The Edge has a good piece that elaborates a conversation between them and other people involved in this field. Relatively non-technical. How powerful is this method to provide an evolving set of strategies between competitors? And how is this related to game theory based approaches? Bain Insights: Which makes considerable sense. " ... The revenues and stocks of companies with highly engaged workers outperform those of companies with low engagement levels. Yet too many companies still seek to foster engagement through programs that are disconnected from customer priorities ... "
In Progressive Grocer: Safeway joins with Duke-Ipsos on shopping research. More on that effort. There has been relatively little I have found on this shopping research effort since its start. Can someone from Duke or Ipsos contact me to discuss? I will then be glad to further report on and analyse the effort here, where it will be seen by retailers, manufacturers and marketers. In particular it will be interesting to compare it to other enterprise efforts. Analyzing raw video from cameras. Videomining, a company we talked to as a potential solution for analyzing retail video lab stores that examined shopping contexts. " ... VideoMining Corporation is the leading provider of in-store intelligence for consumer product manufacturers and retailers. VideoMining’s breakthrough measurement and analytics platform is based on patented, proprietary software for converting in-store video into rich statistical data on shopper behavior and demographics. We provide consumer product manufacturers and retailers actionable insights into factors that impact shopper behavior—insights that allow clients to continuously optimize shopper marketing and merchandizing strategies.... "
I see in Engadget the military is looking for universal remotes for drone fleets. I was thinking about the general idea of how to make a remote universal the other night, as I used one remote on an upstairs device, and another very different one on a down stairs device. Leading to many mistakes and inefficiencies. I was also testing a new software interface on a laptop and then on a tablet device. Key differences in this case are that the use of a 'mouse over' to preview information does not work well on the tablet. So the elements of interface are linked to the hardware, and the differences in remotes cause errors. And more about multi-control. Brought to my attention. Worth examining as an alternative to blogging with the ability to directly monetize the interaction. An approach I think will continue to advance. Safeway takes some good steps. Making connections more digital, more App-like. This will connect data, information, choices, promotions and rewards in one place, always available in the pocket of the shopper. Connected to their Social-Mobile-Local engagements. Instructive examples of where the use of QR codes failed for specific brands. " ... review of hundreds of 2D-based campaigns, for every one campaign that does deliver something (i.e., value, relevance, meaning, benefit, or a real interactive experience for the consumer) via the code, there are three campaigns that don't and fail in part or altogether. ... "
In GigaOM: This goes to the expected places, well written and worth examining closely for any business. Further, I think that some of the companies that are archiving big data resources for future value will have to consider that it could be mined for liabilities yet unknown. Patterns are especially rich kinds of data. Microsoft intending to compete with Google Glasses using Kinect Glasses. Will Mac Glasses be next? Will we all voluntarily identify with this level of geeky social connection? Just discovered this. The OR Exchange. Constructed by Informs to act as a social exchange for questions about business analytics. I have been a member of Informs for many years. See also their other social connections. Include, I see, some very recent social interaction methods like Pinterest. Nicely done. In Technology Review: It appears that new and powerful viruses are on the rise. Will we simply have to deal with endemic virus infections in the future? Marisa Brown on emerging practices in quality measurement. And key foundational practices required to implement and maintain a stable and effective quality measurement system ... "
It is more about perceived status than badges. But then badges can imply status. Depending as I have said many times before, on the context and embedded culture. If badges are seen as silly in a corporate culture, they will not work. For the digital era. Not an easy thing to do, but becoming increasingly important. I like the mention of tbe Baby Boomers contribution here. Much forgotten. " ... While the Millennial generation drives the latest trends in technology, it's worth remembering that it was the Baby Boomers who put the "e" in email, e-learning and e-commerce. The foundations of the Digital Era that forever changed the way we work, shop, learn and play were built by innovators born from the mid-1940s through the 1950s. The past half century has been a period of building great businesses founded on technology-driven processes that run by the clock and the calendar. In the new millennium, however, technology has been redefined -- as has the employee..."
A very telling article on the Process of using Games in DOD applications. My own experience working for the office of the Joint Chiefs in the Pentagon was to perform and repeat very large tank battle simulations of scenarios that were to take place in the Fulda gap in Eastern Europe. But these were done well before you could readily perform the interaction in game style. Still, there were hints that this could be done in game style dynamics that showed cooperative engagement in the task. A presentation. . On SoLoMo and how it is changing our engagement world. My previous note led me to Autodesk 123D. Available as an App on the iPad. Taking ordinary photos and turning them into 3D models. See their blog for instructive examples. We worked with Autodesk from the early days of using them for CAD design and analysis. The example here is in art, but I can see this happening much more broadly. Consider too, its potential integration with remote manufacturing. " ... using a free program called Autodesk 123D Catch. Then he used the maps to print miniature plastic replicas on the $2,000 MakerBot 3-D printer in his home office. And he made one of his best scans freely available, uploading it to the Thingiverse site where MakerBot enthusiasts share digital plans.... "
A topic we spent time simulating and examining in laboratory settings. A new look at the factors determining shopper behavior. How can re-design and better shopper engagement solve the problem? A piece of research that suggests that over leveraged cloud services could cause service meltdowns. he suggest that these interdependencies are still little understood. Good overview about the process. Simple focused and uncluttered. " ... It’s no secret that the customer experience is critical to business success. However, creating a memorable customer experience doesn’t materialize from simply having a solid brand or an outstanding product, but rather from using detailed insight into past customer behavior, buying habits and individual feedback. ... "
If you can't attend ACM's Turing Centenary Celebration, you can still experience the thrill of rubbing elbows with ACM Turing Award winners—virtually! On Friday, June 15 and Saturday, June 16, more than 30 Turing Award recipients will gather to commemorate the 100th anniversary of Alan Turing's birth with personal remembrances, talks, and panel discussions. And ACM plans to webcast the entire event live! Don't miss this once-in-a-lifetime opportunity to learn about computing's past and future, from the unique perspectives of its pioneers and leading contemporary thinkers. Bookmark this site in your browser now: http://turing100.acm.org/webcast, and please note that all times listed are Pacific Daylight Time (PDT). MJ Perry reports. Increasingly, suppliers of remote online expertise are gaining acceptance. Expect this to continue as the Cloud increases its resources. Fairly obvious. But worth reviewing for understanding how shoppers interact with labeling. Shoppers also interact with labels differently according to the store and shelf context. Dad's increase their influence on shopping, according to recent study. " ... with 52% reporting being the household's primary grocery shopper, according to the 2012 Cone Communications Year of the Dad Trend Tracker. The survey also found that a higher percentage of dads than moms prefer getting in and out of the store as quickly as possible. Dads are also twice as likely as moms to seek input from other family members on what to put on the shopping list. ... "
In a further nod to the sexiness of big data and mobile tablets, Tibco's Spotfire analytics and visualization tool has added a number of new capabilities. Spotfire has, over the years, drawn the attention of many enterprises. " ... Spotfire 4.5 will become generally available this month and features a data service connector to Hadoop, which is known for its ability to handle unstructured data such as weblogs, sensor information and text. The connector will allow users to combine and analyze information from Hadoop clusters along with structured data from business applications such as an SAP or Oracle ERP (enterprise resource planning) system.... "
On the evolution of the computer science degree. I had a discussion with a prof recently on his school's removing the CS degree and how businesses adamantly disagreed with the change. Information Science anyone? In Forbes:. A new era in advertising. A Money machine? " ... Coca-Cola and Procter & Gamble are the leading bell weather and market indicators in the advertising business. So when I saw a Coke press release with a SF based startup thismoment.com - a company that I’m following – the news caught my attention big time. Coke announced the Coca-Cola TV Project with entertainment including Paul McCartney engaging directly to users with social media infrastructure and big data. Similarly, Procter & Gamble recently launched their Olympics campaign“Thank You Mom” in time for Mother’s Day and it creatively profiles Olympic hopefuls from childhood to the medal podium at the Olympics.... "
Have always been interested in how smaller to mid size companies can utilize large enterprise technologies and processes. Having worked with many startups and large enterprises, I saw how technology could greatly help the midmarket players in virtual collaboration and speed to understanding of the market. IBM recently did a study on the subject that is work reading. Available here. Both very broad and in depth view.
" ...The 2012 IBM Global CEO Study, “Leading Through Connections” is a result of face-to-face conversations with more than 1,700 CEOs in 64 countries and 18 industries. The study reveals three essential imperatives that cut across geographies and industries: empowering employees through values; engaging customers as individuals; and amplifying innovation with partnerships. For Midmarket organizations, businesses with 100-1000 employees, the CEO Study customer imperative rings particularly true. Today’s connected consumers are empowered, and they demand instant access to personalized content on their own terms. Of the 226 Midmarket CEOs interviewed for the CEO Study, 76 percent cited strong customer relationships as a primary source of sustained economic value for their organizations. Sixty-seven percent pointed to theimportance of human capital, while half cited product and service innovation, and one-third called out their partner network.... "
As an example, my recent collaboration with a startup and a very large enterprise used a Cloud solution that allowed each of the participants to post updates to research in a shared folder. As new findings were discovered, notifications were sent to all, and each could comment on the results. The results were quick and simple, without learning a software system. Its access on mobile devices allowed participants to quickly respond. This led to innovation in the space and alignment to next steps. An excellent example that any business, from individual to enterprise, can use. I see this ability continuing to expand. The small to mid market groups need more of this capability. MIT research work in letting machines collaborate in manufacturing processes. Safety and coordination have frequently been issues in making this happen. Recorded Future posts about the use of their future-looking tool to analyze the Eurozone before and after the Greek elections. I am looking at their tool for a number of applications now. It could fit in well with more traditional forecasting applications. They are also in the process of testing the next generation of their tool, and you can register to test it. Have followed it since its inception, we continue to work with it in the enterprise, and it is well worth a close look. In AdAge: Cosmetics giant L'Oreal talks their global marketing practices. "...Call it the new Zen of global marketing. On one hand, L'Oreal seeks more products and marketing ideas from places in Asia, Africa and Latin America, where it expects most of its next billion consumers to come from in the next decade. But Mr. Menesguen's job is also to find marketers doing things right at any of L'Oreal's far-flung outposts and then spread the best practices around as quickly as possible throughout the company.... "
As robots are starting to look more like people, the concept of what this means to our impressions of computing and interaction is starting to become important. The concept of the 'uncanny valley', was developed by Japanese Researcher Masahiro Mori. It represents the inherent uncomfortableness of the humanoid representation of robotics. In an IEEE article Mori is interviewed about the concept. In Drug Store News: Wal-Mart is piloting a talking prescription system for the visually impaired. HIT YOUR PERSONAL RESET BUTTON. Our daily lives are beyond complicated as we try to juggle life’s competing demands, sip from the 24/7 fire hose of information and navigate these increasingly turbulent economic times. You, all of us really, hunger to learn more, understand more, contribute more. We yearn for more balance in our lives. We can’t be all things to all people, as much as we try. Read more about it and order here. A new piece on the experimentation with doing mobile shopping along frequently traveled consumer paths. We are seeing new kinds of shopping and data being provided by mobile. The use of the Adstock Model was just brought to my attention. Have never utilized it, but wonder of there are others out there who have and have some comments on its broad use, especially beyond its usual use in TV ads, here is the abstract, from the full technical paper.
" ... This paper is intended as a review of existing models of Television Adstock transformations that enable the inclusion of dynamic and nonlinear effects of Television advertising within linear sales response models.Television advertising is one of the largest investments for consumer marketing and companies invest a lot of effort in measuring the impact and ROI of TV advertising. This is typically done using either individual response(e.g. Discrete Choice models) aggregate response (e.g. Marketing-mixmodels). For the purposes of this paper, we will restrict our inquiry to aggregate response models. These models are linear in parameters but canaccount for non-linearity through variable transformations.... "
An important point in this general overview of the integration of Business Intelligence and Geographical Information Systems. GIS is a database with geographical components. We were early users of this concept, where the Geo aspect of the data came from addresses, inferred location and even satellite sensors. Now we have much more of this kind of information, with information coming from many more sensors. I suggest further that it is further useful to flip the leverage and make sure to also put the Analytics into the Where. That allows you to build improvement into the gathered data. A good overview of how ethics and increased data capture relate: " ... As the collection, organization and retention of data has become commonplace in modern business, the ethical implications behind big data have also grown in importance. Who really owns this information? Who is ultimately responsible for maintaining it? What are the privacy issues and obligations? What uses of technology are ethical — or not — when it comes to big data? These are the questions authors Kord Davis (@kordindex) and Doug Patterson (@dep923) address in "Ethics of Big Data." In the following interview, the two share thoughts about the evolution of the term "big data," ethics in the era of massive information gathering, and the new technologies that raise their concerns for the big data ecosystem.... "
From Fujitsu Labs: A Unique way of identifying yourself: " ... The module shines near-infrared light onto a person’s hand. The deoxygenated blood in the veins absorbs the near-infrared light, while the rest of the hand lets the light pass through. A sensor in the module records the image of the hand, where the veins show up as dark lines. Then a software program compares the image against the template on record for that individual.... "
Playful Wingmen. What looks to be an interesting thought. Marketing improved via game dynamics. Everything is a game, and some new views of their dynamics. Their position paper. Hardly needs to be said.. Have seen it many times. When you are in a position of power in a group meeting, it's often better to shut up rather than express your initial reservations. Save them for later individual meetings, and then express them with caution and with strong appreciation of the creativity provided. From Intel: A means of using facial recognition to target ads. " ... Intel has developed a new set-top box that will monitor who is watching TV at that moment, enabling advertisers to target the most appropriate ads to them. The box does this by using facial recognition technology.... "
I can see this also being used to understand what information is needed to fill-in aspects of what still needs to be understood. And direct interactions between devices and people. Using QR codes as a time station: The simple check-in idea has become more common. Simple is often good to build upon. Via Walter Riker. ComputerWorld reports: To provide thumbnail encyclopedic information based on search requests. This would be akin to the fact that Wikipedia hits often come up first on Google searches. Promotes the Britannica's online resources. I have had reason recently to re-examine the use of expert systems to understand and improve complex business processes. I have mentioned a package called Visirule in this blog a number of times. Those mentions also outline some of our enterprise experience with expert systems in the mid to late 80s. Some of these systems were used for years to make our processes more efficient. Visirule and other offerings of their company LPA deserves a look. See also a detailed powerpoint presentation on how it works. And a article on the visualization of process logic. And another related article. I think it is time for use of Expert systems, combined with quantitative analytics and the availability of increasing amount of available data, to lead to better business solutions. Join me in this quest. In a unique and novel approach a faux food truck in NYC and Chicago is decorated with QR codes. 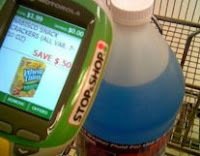 Allows the walking shopper to buy an assortment of popular consumer package goods. Similar to some of the virtual stores reported on here lately in transit passageways. " 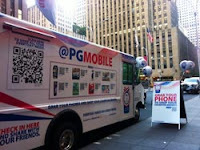 ... giving residents an opportunity to scan QR codes with their mobile phones to order P&G products from Wal-Mart Stores. Similar QR codes will be on display at bus shelters in Chicago. "People have yet to really adopt buying consumables online," said P&G spokesman Tim Marrin. "We think having free delivery, and getting this message out to urban shoppers who don't have access to Wal-Mart stores, is a great first start."... " In Chief Learning Officer: " ... Economic models change and firms follow, dragging the accountants kicking and screaming. Understanding business’ new value equation can beat the competition. Accepting that learning is linked to value allows us to shift our focus to a different set of questions, the most critical of which is “value to whom?” To answer this question we need to begin with value, and by association, finance and macroeconomic theory ... "
Top 2012 IT trends from Gartner. " ... Gartner kicked off its Infrastructure & Operations Management Summit here today with a "top 10" list of the most significant emerging trends that will impact data centers and information technology used by businesses and government from now into the next four or five years. The list was presented by Gartner Chief of Research Dave Cappuccio in a keynote address, in which he explained there's often a cascading effect as one trend such as employee mobile devices and cloud use affects others such as helpdesk operations.... "
The ThreeJoy site points us to Dan Pink's " ... RSA Animate video from his bestseller Drive is a terrific way into the potential for intrinsic motivation in engineering education transformation ... " . Had missed this but worth watching. Via David E Goldberg. " ... Intrinsic motivation refers to motivation that is driven by an interest or enjoyment in the task itself, and exists within the individual rather than relying on any external pressure ... "
In AdAge: This is not about new kinds of reality, but about linking pictures of brands to the real thing. Apple does it well with their stores. Varies by the kind of product. And this has seen the outbreak of 'show rooming' in retail. There are products I want to and even need to see, touch and feel before I buy. Good overview about how 3M is addressing the complexity of its supply chain. The solutions used are common examinations that a large enterprise has to make. Analytical methods to address these complexities have been used to improve the supply chain since the 60s. In the Lat Log Blog; Excellent piece on elements of a perfect map. Maps are simplifications of very complex and data rich concepts. The drive continues to think about how to make them even better. Beyond that, Google looks at how their 3D maps can be improved: " ... we are excited to announce that we will begin adding 3D models to entire metropolitan areas to Google Earth on mobile devices. This is possible thanks to a combination of our new imagery rendering techniques and computer vision that let us automatically create 3D cityscapes, complete with buildings, terrain and even landscaping, from45-degree aerial imagery. By the end of the year we aim to have 3D coverage for metropolitan areas with a combined population of 300 million people.... "
Pretty obvious that Cloud concepts will be important for data delivery to Business Intelligence. A quick take here. Expect the trend to continue as more social and sensor data starts to arrive to be leveraged for use. Mckinsey on the crowd sourcing of strategy. Can the crowd have strategic wisdom? And, which crowd should be involved? The latter is often a key issue in crowd sourcing. What is the incentive of the people you involve? Information Week article on how the enterprise can best use social networks. I was involved with the examination of social networks to get things done. Part of the argument was that new hires were coming in with the expectation that social interaction was already part of their day to day work. But it also led to some lack of focus. So how to you integrate social networks to the tasks at hand? I am still supportive of selective and directed social networking use. Its a means of easy and group connection and interactive. A good examination of some of the direction. I don't usually include enterprise activity that is not technical here, but I was involved in the Pringles, Folgers and other Food business for a while so this final move outside of the food business is of interest. Concerned in general about less product diversity. "The IBM Smarter Analytics Signature Solutions include the IBM Smarter Analytics Signature Solution - Anti-fraud, Waste & Abuse. Each year, health care fraud tops $250 billion, according to the FBI. Tax fraud costs billions more. IBM's adaptive systems learn from the latest data, helping to protect against emerging fraud. The solution embeds advanced algorithms directly into business processes, providing government agencies and insurers with the ability to detect fraud in real time - before funds are paid out. Using IBM's sophisticated analytics, the solution recommends the most effective remedy for each case, optimizing an organization's finite resources. For example, the system might recommend that a simple letter requesting payment be sent to resolve one case, while recommending that a full investigation be opened in another case .."
As we continue to see this increase of available data, new examples of tailored problem-specific solutions will continue to emerge. They will also start to include specific expertise for these areas, so that the application of the analytics methods will no longer need room fulls of experts for their application. In addition the methods will leverage pattern recognition techniques to first detect the problems, then apply the right methods to solve them. So it all about being smarter. Being smart is first knowing you have knowledge about a substantial problem, gathering the right data to support a solution, finding a solution that can be applied and adapted to the given problem and then support the decision maker to apply the right solution correctly. Such smarter solutions are what every size organization needs. I have had an interest in SimCity since its early days. Executives came to us soon after its launch to ask if we could produce a similar simulation for the entire enterprise. At the very least for training, and potentially for constructing predictive simulations of how the entire enterprise would work under new conditions. We explored those ideas, and it ultimately led to some very creative analytics. So it was of interest to me that SimCity will now also exist as a game on Facebook. Will this create further new opportunities? Worth exploring. From SAP " ... launched new data visualization software that taps into one of its standby BI releases and relies heavily on HANA, the in-memory database that’s a big part of the vendor’s future. SAP Visual Intelligence, a desktop version of its BusinessObjects Explorer software, enables layered views, queries and report building that SAP intends to be led by business users.... "
I have read MIT's Digital Review for many years, it used to be my prime source for digital information, long before there was much rich forward looking content on the Web. I received their print mag for years Now it is reported that the are going Digital First, with a unique openness. Good to hear. More about their motivations in GigaOM. For those interested in Bayesian Network Analysis as a modeling technique, I see that BayesiaLab has come out with a new version with many new capabilities. All described in their newest newsletter. We used Bayesian network techniques to address certain kinds of analytical models. Worth knowing about. Relatively too little used for predictive analytics. In the Sloan Review: I agree that you can over quantify. But you should not ignore the numbers either. Its also good to think about the exogenous interactions that are still beyond numbers. Still, I disagree with being an extra-rational manager, though in practice it does happen. Correspondent John Lucke tells me about some of the work they are doing at Carnegie Speech to increase English proficiency among airline pilots. This was written about in a recent NYT article. What interests me is how this approach can be used in specific contexts. Since we can't all learn new languages fluently, how can we learn speech for key contexts we need? Pilots are an excellent example. " ... the true measure of language learning success is the ability to be understood – and to understand – when speaking a language. That is why business , aviation, government, health care and education enterprises count on Carnegie Speech to ensure that their personnel can communicate when their clients, employees and students depend on it.... "
Another example of augmented reality. And an application of integrating wearable devices to adjust your sensory data view. I wonder how such a method will be tolerated. An implanted solution might be better used here. But consider it as part of a broader approach to support motivation, discussed here recently. A telling post on the topic. I recently had to deal with several episodes that were potentially the result of virus attacks. My installed software apparently did not deal with the problem. A quick search of other similar events found that I was not alone. The concern continues that we are on the edge of serious viral danger as governments and other well funded organizations build skills in this area. Are we at the edge of mutually assured cyber destruction? The establishment of a technology testing city. " ... An international technology company is creating an empty city in New Mexico to test and evaluate emerging technologies without having to worry about interfering with human beings. Who would build a new city covering about 15 square miles in the southeast corner of New Mexico, but not want anyone to live there? Pegasus Global Holdings, that's who. This private international technology company is behind CITE, The Center for Innovation, Testing and Evaluation.... "
My previous note about Dan Ariely's Conscience+ App led me to reinvestigate the concept of Motivation Waves, as described by BJ Fogg in this excellent video. He specifically uses the example of health UX design via a keynote address he gave back in March. He makes the case that it is not about motivating behavior change, but facilitating behavior change. And how you do that with a number of techniques that involve infrastructure change and small steps. More on Fogg's site. Where he discusses behavior design and his 'tiny habits' approach. A friend who is involved in counseling found similarities to her space. Continuing my investigation of this and related approaches for client applications. Can an App significantly help you make the right choice? Dan Ariely has published an App called Conscience+, which contains a number of simple reminders about many of the common choices in life we make every day. I downloaded it and overviewed. It is Ethical and behavioral. Padding the expense report and overeating. And many more topics. Is it enough to just point out the issues involved? He writes about it in his blog. This also brings to mind Stanford's Persuasive Technology Lab. We interacted with their director BJ Fogg for capabilities in the 90s that addressed marketing persuasion. In the WSJ: " ... High-tech implants will soon be commonplace enhancements under our skin and inside our skulls, making us stronger and smarter. Daniel H. Wilson on our 'superabled' future. .... " And controversy, like that in the recent spelling bee, where a contestant had received a neural implant, for medical reasons, that apparently made her a super-memorizer. In Forbes: Simplistic, makes some large assumptions. But should be read by management that does not understand the power of social media. Now in Beta, called Widbook, a YouTube like play for creating, reading and sharing books. " ... Book lovers and authors can share stories with others in their social networks, as well as create digital bookshelves to peruse. One of the most interesting features of this site is the ability to collaborate with other authors to create a digital book.... "
Another look at Prezi, the zooming interface. I see there is now an iPad viewer that lets it work outside of Flash. A little akin to 'dynamic' transitions in Powerpoint sides, but more interesting. Attention grabbing, but does it emphasize the actual content? Or is this an infographic type play? Also allows a more non linear approach to slides, which I like. Good examples at the site. Like the one at the right on SaaS in the enterprise. I had plans to try it with a presentation, but have not used it yet for a serious effort. Point me to more examples, please. Had a meeting with a company, Videolocators, which is crowdsourcing the finding of missing children. A clever approach that combines text, video and the use of targeted Google Adwords to make an efficient engagement technique to find missing people. Check out their site and join the search. In Adage: A clever idea for online engagement from Wal-Mart. " ... Walmart.com's march to catch Amazon in e-commerce and integrate online and offline offerings is entering some new fronts and generating sometimes surprising results as the company prepares to launch the latest in a spate of new initiatives -- Goodies, a subscription mail-order-sampling program. Goodies, set to roll out within about a month, will initially focus on artisan and other food products but could expand to other product categories ... "